Virat Kohli Indian Captain In World Cup 2015 ? 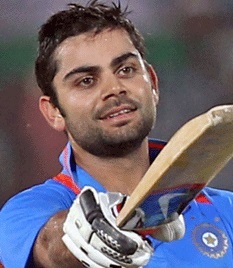 Should Virat Kohli Be Indian Captain In World Cup 2015 ? Looking at this Indian squad you cant help but think that very soon Virat Kohli will be leading Indian cricket team in both limited over and test cricket, but will he be a good choice to be Indian captain for upcoming 2015 cricket world cup ? Dhoni has not been at his best both with the bat and with the captaincy but Kohli has been sensational with his batting and he just like Sachin Tendulkar in the past is relishing batting at the top order. He was stand in captain for the first test match against Australia which India end up losing, Dhoni made a comeback in second test match and it was a loss again. Now looking at the captaincy issue it will be a good idea to let dhoni be captain for the world cup 2015 and after that hand over the captaincy to Virat Kohli. But if India wants to make a statement before the world cup the best thing they can do is to appoint Kohli as captain who is more talented than Dhoni, aggressive and can lead from the front, after all he will surely be handed captaincy once Dhoni decide to leave limited over cricket. He will get massive experience in the couple of months from world cup campaign as a captain and it will only help Indian cricket in long term basis. Experts will say, well he is not experienced enough and why would you make him captain if you have one of the most successfull captain in history of indian cricket in MS Dhoni, but the point is Dhoni is at the stage of his career where he has to decide his future. Virat Kohli on the other hand has a perfect response as a captain whenever he took the field. His ODI batting average is sublime anyway, but whe he takes the field as a captain he become even more prolific and thats exactly what you want from a captain (leading from the front). He is aggressive and will make mistakes here and there but personaly I think India should have appointed him as permanent limited over captain last year. here is his batting record as a captain. Looking at these statistcs Kohli is in great position to be named captain once Dhoni decide to give up his ODI captaincy, but If indian cricket board want to make a statement they should do it before the world cup which will not only give Indian a new dimension but will also fast track Kohli’s grooming as a captain. What you think Virat Kohlis captaincy ? will he make a good captain, should India appoint him before the world cup ? let me know your thoughts using the comments section below.